We are a tad fixated on Hal Ashby here at Stand By For Mind Control. I have watched everything the man ever made, including his objectively unwatchable later films. I tracked down the television-concert special he made for Neil Young, read the Hawkline Monster — an insane book he’d been developing, and I suffered through Second Hand Hearts, a film so abysmal they’ll only burn a copy of it for you on request. But I’ve never seen his last project — Jake’s Journey. Practically no one has. It exist, and yet it doesn’t, much like your grasp of reality. Jake’s Journey was a television show that almost was. And therein lies the story. 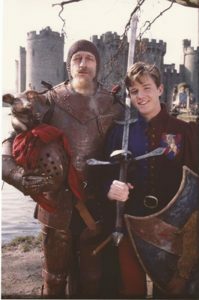 Ex-Python Graham Chapman got approached by a producer looking to make a sitcom based on Mark Twain’s A Connecticut Yankee in King Arthur’s Court — a relatively dull idea that Chapman didn’t take to. But when he heard what they wanted to pay for one measly sitcom script, he changed his mind. Chapman convinced them that he should be given latitude to open the idea up, to include not just a boy who mysteriously gets transported back to Arthurian times, but a story in which the characters flit all over the damn time and which would include — among other things — giant lobsters. Who could say no to that, right? Chapman and his companion/collaborator David Sherlock wrote a bunch of pages in a hurry and got the thumbs up from the suits at CBS. A pilot was commissioned, to be shot in London in 1987. The lead role of Jake — a teen who’d just moved with his family from Dayton, Ohio to London — went to Chris Young (of Max Headroom not-quite-fame). When casting the co-starring role of Sir George fell flat, Chapman stepped up to take the part himself. 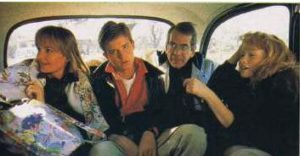 Peter Cook, Gabrielle Anwar, and Liz Smith also got in front of the camera for the pilot shoot. But CBS saw the pilot and said no thanks. And then — later, after ABC showed interest — maybe yes. So two more scripts were written before CBS pulled the plug again. The Disney Channel was going to pick the show up but Graham Chapman got flattened by throat cancer and the show was shelved until Chapman recovered — which he didn’t. And Hal Ashby, who directed the pilot, died too. In the clip, they blame the show’s cancellation on “British humor,” but that’s only why CBS bailed — death really did the show in. Leaving it languishing in the misty-mists of misty-pre-internet-nowhere. As near as I can discern, there’s only one known place in the world you can screen it: The Library of Congress has a copy. Anyone live in D.C.? I do not; but I do live near a mailbox! And I got Amazon to send me a copy of OJRIL—the Completely Incomplete Graham Chapman. OJRIL (Old Jokes and Ridiculously Irrelevant Links) is a book for completists, by which I mean there’s scant reason anyone should own it. It contains an un-filmed script for “Our Show for Ringo Starr,” which was co-written by Douglas Adams as a comic promotional thing for Ringo’s album Goodnight Vienna. Then there’s a bunch of other short, irrelevant bits, some blather, and the script to Jake’s Journey, which, as a public service, I will now summarise for you. It begins with a montage of Jake and his family packing up in Dayton and moving to London. There, Jake is miserable, forced to wear a school uniform and eat kippers for breakfast. He knows no one, but, as his little sister points out, he’s got a crush on the girl down the block. His dad tells him to give her a call and ask her out — it’s time he started seeing life as an adventure. 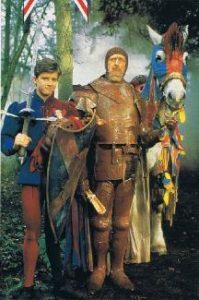 Jake walks to school but is magically transported to Arthurian times. 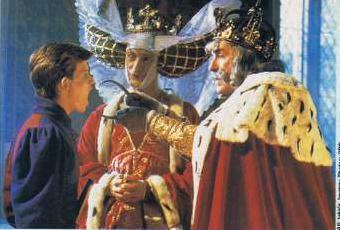 Sir George, a knight who’s seen better days, addresses Jake as if he’s his squire. They’re on a quest to deliver a marriage proposal to the fabled Princess Yeugh on behalf of Prince Kevin the Rich. Why? It’s an adventure. Then, a witch magically appears, delivers a vague warning to “beware”, accidentally sets herself on fire, and fucks off. Sir George and Jake get across a bridge guarded by a troll due to Jake’s trickiness; he flatters the troll and that throws the beast off — instead of the beast throwing them off the bridge and eating them. Sir George and Jake go to an inn called “The Prince and the Metaphor.” There, they try to find out how to get to the castle, but everyone’s afraid to tell them because no one who goes there ever comes back. Everyone’s afraid, that is, but two human-sized lobsters wearing spandex biking gear. Jake, again alone, meets the King and Queen, who explain that they’re very greedy and that they need to find a very greedy prince to marry their daughter, or their grandkids will risk turning out not greedy. The Queen is so greedy she only says “Good evening”, as she doesn’t want to give anything else away. Chapman also plays the Queen. They leave and the Princess comes down in all her beauty. She takes a shine to Jake. Jake tries to give her the marriage proposal. She mistakes him for a prince, thinks he’s the one, and calls in the test of his worthiness — a pack of wolves. Sir George appears in time to rescue Jake, who jumps through a trapdoor back into his own kitchen. Back in jolly old England in the less-jolly less-old ’80s, Jake can’t explain what happened to him but does know it’s time to start seeing life as an adventure. He calls the girl up the street and asks her out. And that’s Jake’s Journey. Is it funny? A bit, maybe. Is there anything in it one can easily see appealing to Hal Ashby? No. Not really. Would it have made a good television show? Well, better than Beverly Hills Buntz, surely, but probably not by much. It’s got a bit of that Python insanity, but the script didn’t make me smile and those clips above don’t look too promising. Now, we don’t know how involved Ashby was beyond directing the pilot — maybe he was cued up to direct the follow-up episodes, maybe not — but the impression given from various sources of various trustworthiness is that Ashby’s work on Being There and his work with Peter Sellers (who Chapman knew), made the connection. And that leaves us almost exactly nowhere. But at least we’re nowhere together now. Well, I guess you did read the script, but still, any show starring Graham Chapman and giant lobsters must, almost by definition, be the best show ever. You can borrow/have the book. It’s a bit amusing for a sitcom. So, I suppose, one of the best sitcoms ever!